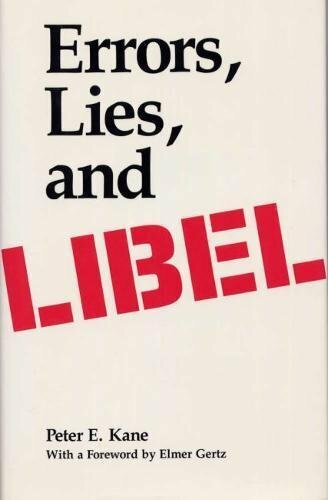 Peter E. Kane takes a critical look at the development of the present law through a discussion of seventeen landmark libel cases. One of the many points Kane clarifies is the important distinction between an error and a lie when judging whether someone is guilty of libel. For example, in the series of events that led to Goldwater vs. Ginzburg, Ralph Ginzburg, publisher of fact magazine, compiled and printed in fact a montage of quotes he had collected from psychiatrists about Barry Goldwater. It took five years of legal sparring for the courts to conclude that Ginzburg had deliberately published a malicious and irresponsible document and to rule in favor of Goldwater. Kane closes with a discussion of current thinking on possible libel reform. If you have any questions about this product by Brand: Southern Illinois University Press, contact us by completing and submitting the form below. If you are looking for a specif part number, please include it with your message.